Launched in 1979, Dr Who magazine holds the Guinness Book of World Records title of the longest running based on a TV show publication. Buy a single copy or subscription to Doctor Who magazine. Comprising comic-strips, inside stories, reviews and much more, a magazine subscription is a must for every Whovian out there. Launched in 1979, Dr Who magazine holds the Guinness Book of World Records title of the longest running based on a TV show publication. Sanctioned by the BBC, Dr Who has a strong focus on the programme’s actors and production staff. Featuring articles on past actors and exclusive interviews with the current stars of the show, Dr Who provides all the insider news every fan could ask for. Dr Who boasts a fantastic comic strip which famous artists and authors have contributed to including John Wagner and Pat Mills. Sidebar comics entitled ‘Doctor Who?’s’ and ‘Doctor Whoah!’, each based on the original story, provide additional entertainment. 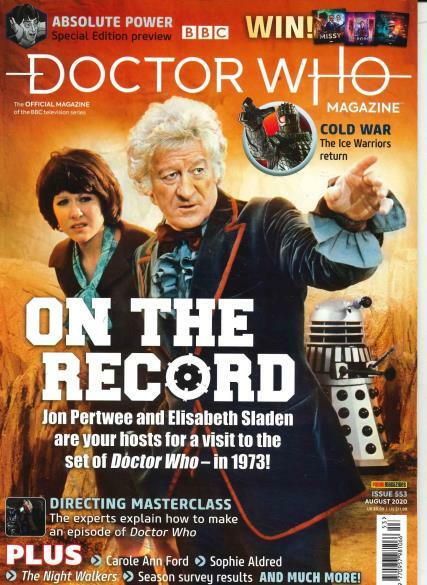 The magazine also examines the current making of the programme and provides commentary on the Doctor's latest travels. In addition, the “Ask DWM!” feature allows readers to pose questions about specific Doctor Who episodes. Entertaining, something for everyone to read about, interesting articles, thanks for the costuming segments! Is a perfect magazine !! I have always loved this informative magazine. Great job. Love reading it every month! Great, as a fan of Doctor Who i always liked this magazine. Great fun reading it. Love the magazine. Thankful there is shipping to USA. Plastic cover protects it well during the shipping process. Being a US life long fan of the Doctor, it's hard to get print items. Your company has filled that gap. Great Pub,Great Company thank you. I love this magazine. A real treat to read it every time. My brother-in-law, for whom the magazine was purchased says it is a perfect companion to his complete collection of "Dr. Who" episodes. It's the first time I buy this magazine and I love it! A lot of interesting topics and very fast delivery to Spain. Highly recommended for fans and casual watchers alike. LOVE Doctor Who Magazine and wish it came out more often! Super excited to get this magazine ! IT IS AWESOME! fantastic magazine only one I read from cover to cover. A very enjoyable magazine, well put together with unique features. Love the in-depth articles on the history of Dr Who. I've enjoyed the first 3 issues so much I'm going to continue to subscribe. Nice, interesteng, high quality magazine. Good in depth information on current things happening in the Who universe as well as exclusive details about the future. Must have for Whovians! Excellent magazine! Full of great information and entertainment for Dr Who fans young and old. I am a Dr. Who fan in the US, so we don't have any way to stay informed. I always look forward to the next issue. Great way to keep informed about an iconic television program. Lets me know the latest products being released and all the last eat Dr Who-themed news - not easily come by in Australia.